When I lived in the Italian city of Milan 13 years ago, I shared an apartment with two amazing, beautiful ladies, one from France, and the other one from Sweden. We all attended the same master’s course in a graduate school in Milan, studying fashion & design management. Despite our shortcomings and different backgrounds, we got along very well, and after a while we became almost inseparable. One day, the three of us took a short trip to Paris to visit the French flatmate V’s family. Three young & crazy women traveling together with a limited budget… Any of you who’s taken a European low cost carrier would understand that their airport terminals are always located in a secluded area outside the city, which requires a long bus ride and a lot of walking/running before/after catching your flight. It was no exception for our Paris trip, and it felt as if we were always on the move in some type of transportation whether it’s a bus or airport shuttle or tram or whatever, but after what felt like a 10 hour journey, we finally managed to arrive V’s home-sweet-home in the Left Bank of beautiful Paris. The trip was a blast, and we got to spend some quality, heartwarming time with V’s parents. Her mum, Maman, was a great cook, although she never admitted she was, and always told us she was cooking nothing special. Maman always gave us a shy, humble smile at our compliments and excused herself back to her small kitchen. After spending a few wonderful days in Paris, it was time for us to go back to Milan. Of course, we had to take the same route back, involving a metro ride to the bus stop and a long bus ride to the distant airport. As is always the case when traveling with V, we were running late to catch our bus and hence our airplane, too. Knowing her daughter very well, V’s sweet Maman prepared sandwiches for the three of us to eat in the bus, because she knew we wouldn’t have time to stop for a proper meal. She made one sandwich with freshly baked baguette from a bakery near by with the leftover pot-au-feu meat from the evening before. The other one was this simple sandwich made with a Pan Viennoise (long soft milk bread) with butter and boiled pink ham. Both of them were so simple but exceptionally tasty. It was the first time for me to eat Pan Viennoise as sandwich, and I can still remember the perfect combination of the milky butter and the salty tasty ham… Mmm, it was absolutely divine. Now fast-forward to the present time in Tokyo in 2017, I randomly spotted Pan Viennoise sold on the shelf at a nice French bakery in our neighborhood. 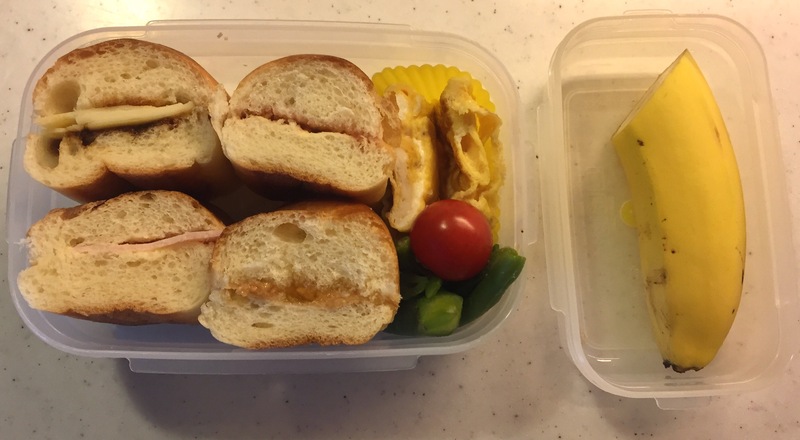 The next morning I made a sandwich using the Pan Viennoise I bought, of course with boiled ham & butter, just like what Maman made for us 13 years ago, for my little girl’s kindergarten bento. I prepared the sandwich, thinking of V’s dear Maman with a sweet smile as well as my precious memories of my time in Europe.